Download "CHAPTER 7. 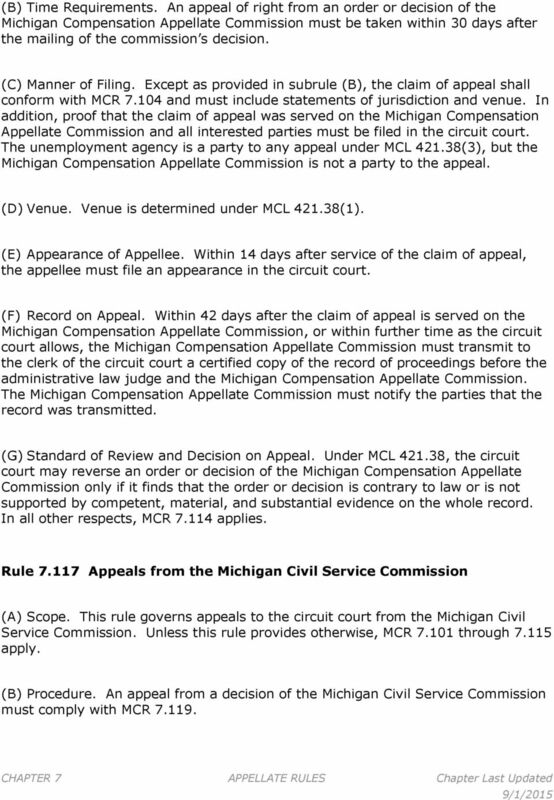 APPELLATE RULES MICHIGAN COURT RULES OF 1985"
6 (2) proof that a copy was served on all other parties. (D) Reply. Within 7 days after service of the answer, the appellant may file a reply brief that conforms to MCR (E) Decision (1) There is no oral argument unless directed by the court. (2) Absent good cause, the court shall decide the application within 35 days of the filing date. (3) The court may grant or deny leave to appeal or grant other relief. The court shall promptly serve a copy of the order on the parties and the trial court or agency. (4) If an application is granted, MCR governs further proceedings, except that: (a) the filing of a claim of appeal is not required, (b) the appellant must complete the acts required by MCR 7.104(D) and (E) within 7 days after the entry of the order granting leave to appeal, and (c) an appellee may file a claim of cross appeal within 14 days after service of the order granting leave to appeal. (5) Unless otherwise ordered, the appeal is limited to the issues raised in the application. (F) Immediate Consideration. When an appellant requires a decision on an application in fewer than 35 days, the appellant must file a motion for immediate consideration concisely stating why an immediate decision is required. (G) Late Appeal. (1) When an appeal of right or an application for leave was not timely filed, the appellant may file an application as prescribed under subrule (B) accompanied by a statement of facts explaining the delay. The answer may challenge the claimed reasons for the delay. The circuit court may consider the length of and the reasons for the delay in deciding whether to grant the application. 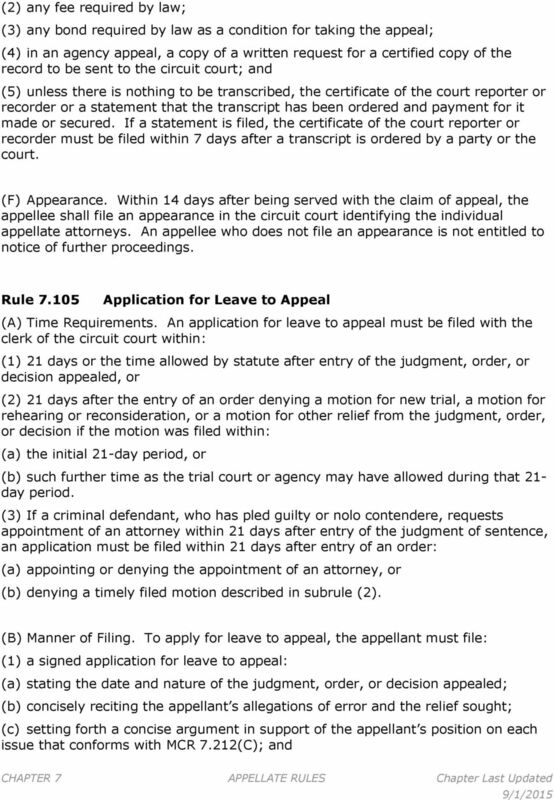 (2) A late application may not be filed more than 6 months after entry of: (a) the order, judgment, or decision appealed; (b) an order denying a motion for a new trial, a motion for rehearing or reconsideration, or a motion for other relief from the judgment, order, or decision, if the motion was timely filed; or (c) an order denying a motion for new trial under MCR 6.610(G) or a motion to withdraw a plea under MCR 6.610(E)(8). 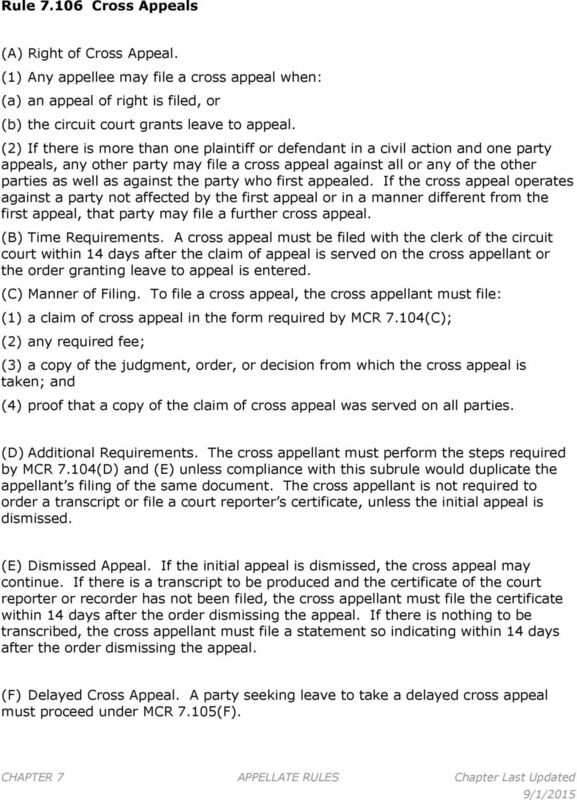 7 Rule Cross Appeals (A) Right of Cross Appeal. (1) Any appellee may file a cross appeal when: (a) an appeal of right is filed, or (b) the circuit court grants leave to appeal. (2) If there is more than one plaintiff or defendant in a civil action and one party appeals, any other party may file a cross appeal against all or any of the other parties as well as against the party who first appealed. If the cross appeal operates against a party not affected by the first appeal or in a manner different from the first appeal, that party may file a further cross appeal. (B) Time Requirements. A cross appeal must be filed with the clerk of the circuit court within 14 days after the claim of appeal is served on the cross appellant or the order granting leave to appeal is entered. (C) Manner of Filing. To file a cross appeal, the cross appellant must file: (1) a claim of cross appeal in the form required by MCR 7.104(C); (2) any required fee; (3) a copy of the judgment, order, or decision from which the cross appeal is taken; and (4) proof that a copy of the claim of cross appeal was served on all parties. (D) Additional Requirements. The cross appellant must perform the steps required by MCR 7.104(D) and (E) unless compliance with this subrule would duplicate the appellant s filing of the same document. The cross appellant is not required to order a transcript or file a court reporter s certificate, unless the initial appeal is dismissed. (E) Dismissed Appeal. If the initial appeal is dismissed, the cross appeal may continue. 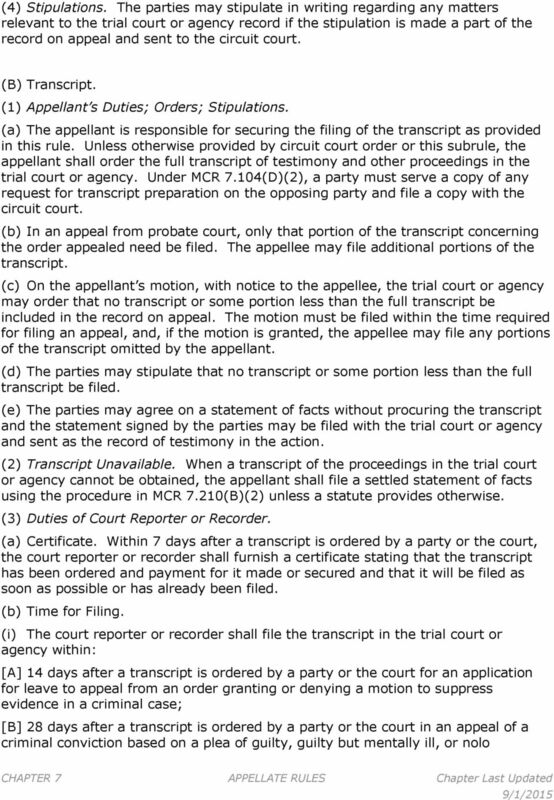 If there is a transcript to be produced and the certificate of the court reporter or recorder has not been filed, the cross appellant must file the certificate within 14 days after the order dismissing the appeal. If there is nothing to be transcribed, the cross appellant must file a statement so indicating within 14 days after the order dismissing the appeal. (F) Delayed Cross Appeal. A party seeking leave to take a delayed cross appeal must proceed under MCR 7.105(F). 10 amount are within the discretion of the trial court, subject to the applicable laws and rules on bonds pending appeals in criminal cases. (2) Bond Form and Content. 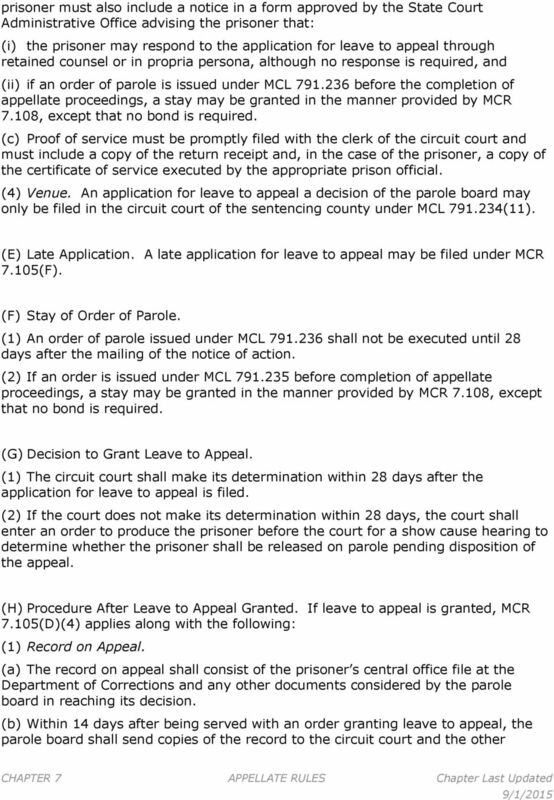 If a bond is granted, the defendant must promise in writing: (a) to prosecute the appeal to decision; (b) if the sentence is one of incarceration, to surrender immediately to the county sheriff or as otherwise directed, if the judgment of sentence is affirmed on appeal or if the appeal is dismissed; (c) if the sentence is other than one of incarceration, to perform and comply with the judgment of sentence if it is affirmed on appeal or if the appeal is dismissed; (d) to appear in the trial court if the case is remanded for retrial or further proceedings or if a conviction is reversed and retrial is allowed; (e) to remain in Michigan unless the court gives written approval to leave; (f) to notify the trial court clerk in writing of a change of address; and (g) to comply with any other conditions imposed by law or the court. (3) Notice of Bond; Objections. A criminal defendant filing a bond after conviction shall give notice to the prosecuting attorney of the time and place the bond will be filed. 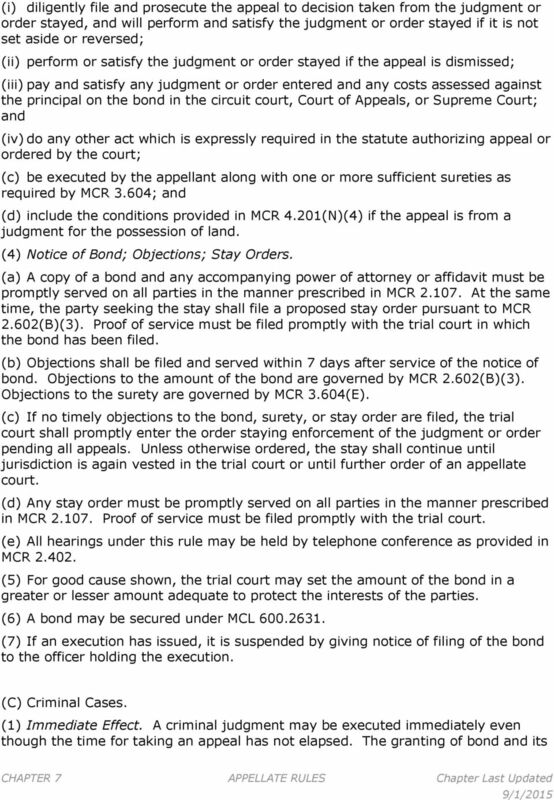 The bond is subject to the objection procedure provided in MCR (D) Civil Infractions. 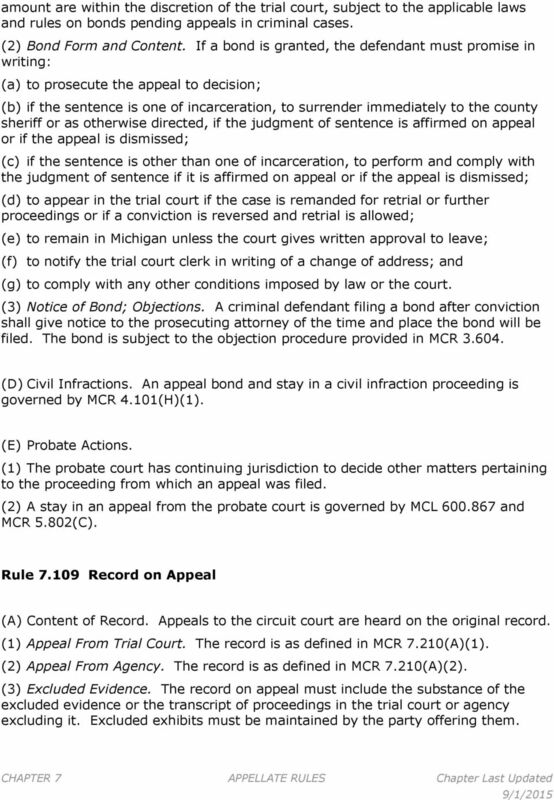 An appeal bond and stay in a civil infraction proceeding is governed by MCR 4.101(H)(1). (E) Probate Actions. (1) The probate court has continuing jurisdiction to decide other matters pertaining to the proceeding from which an appeal was filed. (2) A stay in an appeal from the probate court is governed by MCL and MCR 5.802(C). Rule Record on Appeal (A) Content of Record. Appeals to the circuit court are heard on the original record. (1) Appeal From Trial Court. The record is as defined in MCR 7.210(A)(1). (2) Appeal From Agency. The record is as defined in MCR 7.210(A)(2). (3) Excluded Evidence. The record on appeal must include the substance of the excluded evidence or the transcript of proceedings in the trial court or agency excluding it. Excluded exhibits must be maintained by the party offering them. 13 excused as provided in subrule (B), the record shall be served within 14 days after the filing of the transcript substitute. (G) Transmission of Record. (1) Within 14 days after the complete transcript has been filed or a certified copy of the record has been requested, the trial court or agency shall promptly send the record to the circuit court, except for those things omitted by written stipulation of the parties. The trial court may order removal of exhibits, if any, from the record. Weapons, drugs, or money are not to be sent unless requested by the circuit court. The trial court or agency shall append a certificate identifying the name of the case, listing the papers with reasonable definiteness, and indicating that the required fees have been paid and any required bond filed. The record transmitted shall include: (a) a register of actions in the case; (b) any exhibits on file; (c) (d) (e) all documents and papers from the court file; all transcripts; all opinions, findings, and orders of the trial court or agency; and (f) the order or judgment appealed. (2) Transcripts and all other documents which are part of the record on appeal must be attached in one or more file folders or other suitable hard-surfaced binders showing the name of the trial court or agency, the title of the case, and the file number. (3) The circuit court must immediately send written notice to the parties when the record is filed in the circuit court. (H) Return of Record. 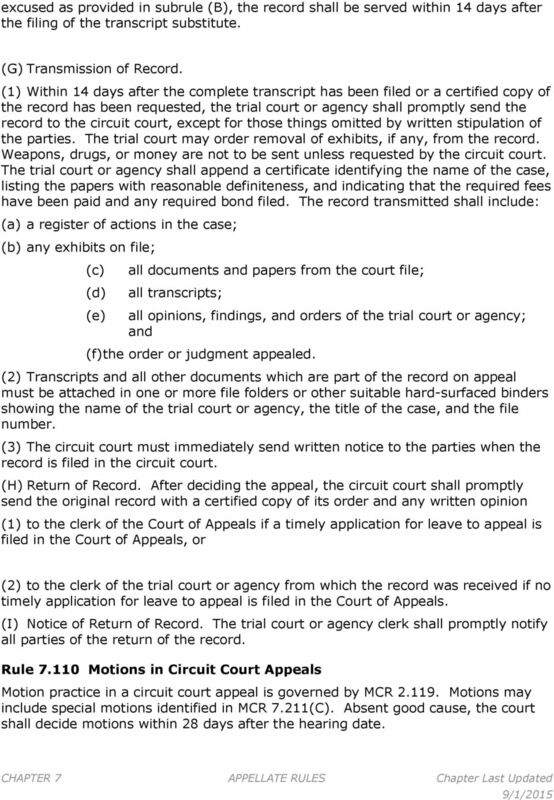 After deciding the appeal, the circuit court shall promptly send the original record with a certified copy of its order and any written opinion (1) to the clerk of the Court of Appeals if a timely application for leave to appeal is filed in the Court of Appeals, or (2) to the clerk of the trial court or agency from which the record was received if no timely application for leave to appeal is filed in the Court of Appeals. (I) Notice of Return of Record. 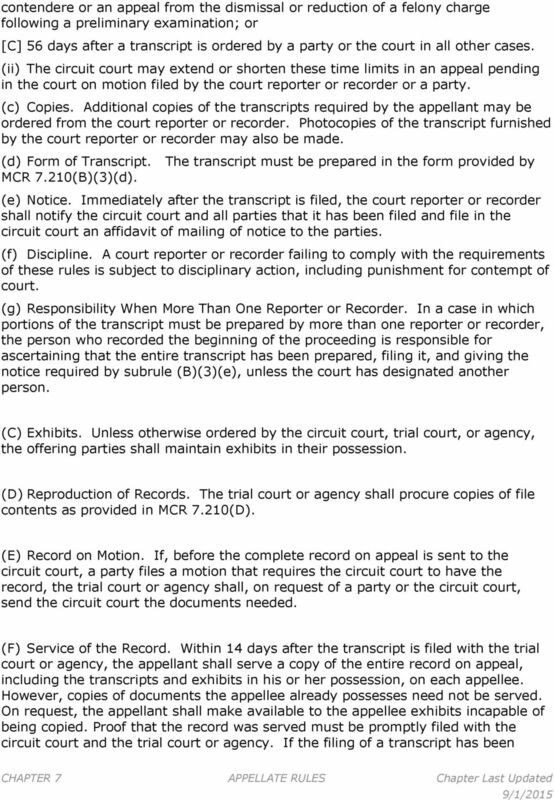 The trial court or agency clerk shall promptly notify all parties of the return of the record. Rule Motions in Circuit Court Appeals Motion practice in a circuit court appeal is governed by MCR Motions may include special motions identified in MCR 7.211(C). Absent good cause, the court shall decide motions within 28 days after the hearing date. 14 Rule Briefs (A) Time for Filing and Service. (1) Appellant s Brief. (a) Within 28 days after the circuit court provides written notice under MCR 7.109(G)(3) that the record on appeal is filed with the circuit court, the appellant must file a brief conforming to MCR 7.212(C) and serve it on all other parties to the appeal. The time may be extended for 14 days by stipulation and order. The circuit court may extend the time on motion. The filing of a motion does not stay the time for filing a brief. (b) If an appellant does not file a brief within the time provided by subrule (A)(1)(a), the appeal may be considered abandoned, and the circuit court may dismiss the appeal on 14 days notice to the parties. Compliance with subrule (A)(1)(a) after notice is sent does not preclude a dismissal of the appeal unless the appellant shows a reasonable excuse for the late filing. (2) Appellee s Brief. Within 21 days after the appellant s brief is served on the appellee, the appellee may file a brief. The brief must conform to MCR 7.212(D) and must be served on all other parties to the appeal. The time may be extended for 14 days by stipulation and order. The circuit court may extend the time on motion. The filing of the motion does not stay the time for filing a brief. (3) Within 14 days after the appellee s brief is served on appellant, the appellant may file a reply brief. The brief must conform to MCR 7.212(G) and must be served on all other parties to the appeal (4) Briefs in Cross Appeals. The filing and service of briefs by a cross appellant and a cross appellee are governed by subrules (A)(1)-(3). (5) Earlier Filing and Service. For good cause shown, the circuit court may grant a motion to shorten the time for filing and serving briefs. (6) Late Filing. Any party failing to timely file and serve a brief under these rules forfeits oral argument. For good cause shown, the court may grant a motion to reinstate oral argument. (B) Length and Form of Briefs. The appellant's brief must comply with MCR 7.212(B) and (C), and the appellee's brief must comply with MCR 7.212(B) and (D). (C) Request for Oral Argument. A party filing a timely brief is entitled to oral argument by writing ORAL ARGUMENT REQUESTED in capital letters or boldface type on the title page of the brief. (D) Nonconforming Briefs. If, on its own initiative or on a party s motion, the circuit court concludes that a brief does not substantially comply with the requirements in this rule, it may order the party filing the brief to correct the deficiencies within a specified time or it may strike the nonconforming brief. 15 Rule Miscellaneous Relief In addition to its general appellate powers, the circuit court may grant relief as provided in MCR Rule Dismissal (A) Involuntary Dismissal. (1) Dismissal. If the appellant fails to pursue the appeal in conformity with the court rules, the circuit court will notify the parties that the appeal shall be dismissed unless the deficiency is remedied within 14 days after service of the notice. (2) Reinstatement. Within 14 days after the date of the dismissal order, the appellant may move for reinstatement by showing mistake, inadvertence, or excusable neglect. (B) Voluntary Dismissal. In all cases where the parties file a signed stipulation agreeing to dismiss the appeal or the appellant files an unopposed motion to withdraw the appeal, the circuit court shall enter an order of dismissal. (C) Notice of Dismissal. Immediately upon entry, a copy of an order dismissing an appeal must be sent to the parties and the trial court or agency. Rule Oral Argument; Decision and Effect of Judgment, Reconsideration (A) Oral Argument. 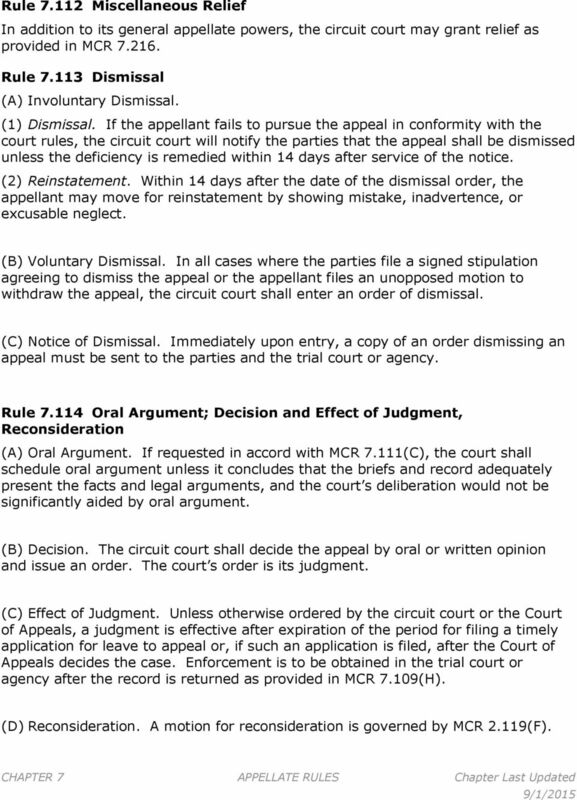 If requested in accord with MCR 7.111(C), the court shall schedule oral argument unless it concludes that the briefs and record adequately present the facts and legal arguments, and the court s deliberation would not be significantly aided by oral argument. (B) Decision. The circuit court shall decide the appeal by oral or written opinion and issue an order. The court s order is its judgment. (C) Effect of Judgment. Unless otherwise ordered by the circuit court or the Court of Appeals, a judgment is effective after expiration of the period for filing a timely application for leave to appeal or, if such an application is filed, after the Court of Appeals decides the case. Enforcement is to be obtained in the trial court or agency after the record is returned as provided in MCR 7.109(H). (D) Reconsideration. A motion for reconsideration is governed by MCR 2.119(F). 16 Rule Taxation of Costs, Fees. (A) Right to Costs. Except as the circuit court otherwise directs, the prevailing party in a civil case is entitled to costs. (B) Time for Filing. Within 28 days after the dispositive order, opinion, or order denying rehearing is mailed, the prevailing party may file a certified or verified bill of costs with the clerk and serve a copy on all other parties. Each item claimed in the bill must be specified. Failure to file a bill of costs within the time prescribed waives the right to costs. (C) Objections. Any other party may file objections to the bill of costs with the clerk within 7 days after a copy of the bill is served. The objecting party must serve a copy of the objections on the prevailing party and file proof of that service. (D) Taxation. The clerk will promptly verify the bill and tax those costs available. (E) Review. The action by the clerk will be reviewed by the circuit court on motion of either party filed within 7 days from the date of taxation, but on review only those affidavits or objections that were previously filed with the clerk may be considered by the court. (F) Taxable Costs and Fees. 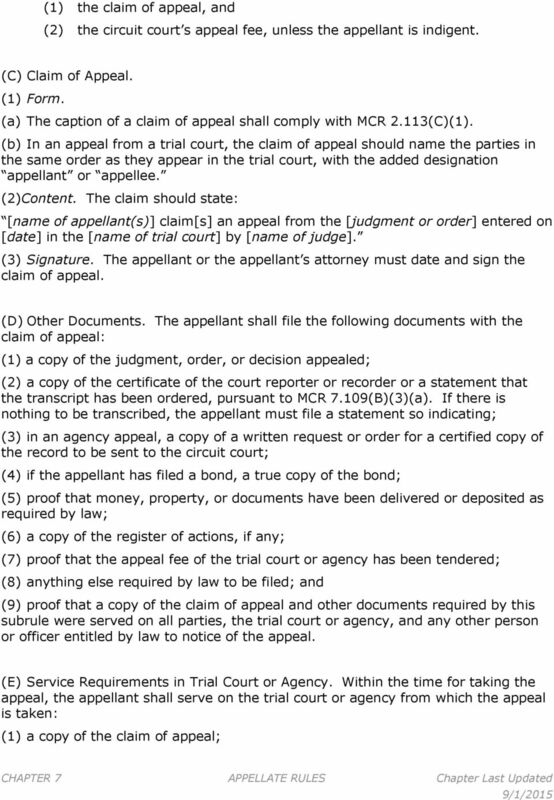 A prevailing party may tax only the reasonable costs and fees incurred in the appeal, including: (1) printing of briefs, or if briefs were typewritten, a charge of $1 per original page; (2) obtaining any stay bond; (3) the transcript and necessary copies of it; (4) documents required for the record on appeal; (5) fees paid to the clerk or to the trial court clerk incident to the appeal; (6) taxable costs and fees allowed by law in appeals under MCL ; (7) the additional costs incurred when a party to an appeal under the Administrative Procedures Act unreasonably refused to stipulate to shortening the record as provided in MCL (2); and (8) other expenses taxable under applicable court rules or statutes. 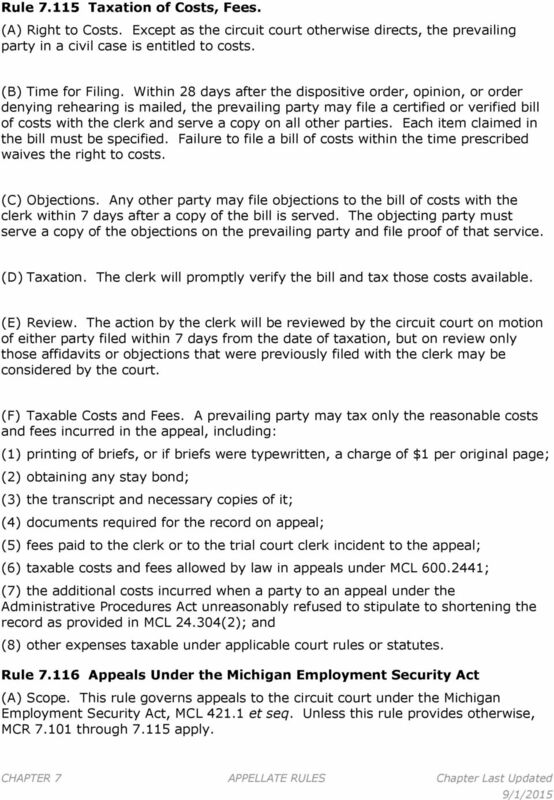 Rule Appeals Under the Michigan Employment Security Act (A) Scope. This rule governs appeals to the circuit court under the Michigan Employment Security Act, MCL et seq. Unless this rule provides otherwise, MCR through apply. 20 parties. In all other respects, the record on appeal shall be processed in compliance with MCR (c) The expense of preparing and serving the record on appeal may be taxed as costs to a nonprevailing appellant, except that expenses may not be taxed to an indigent party. (2) Briefs. 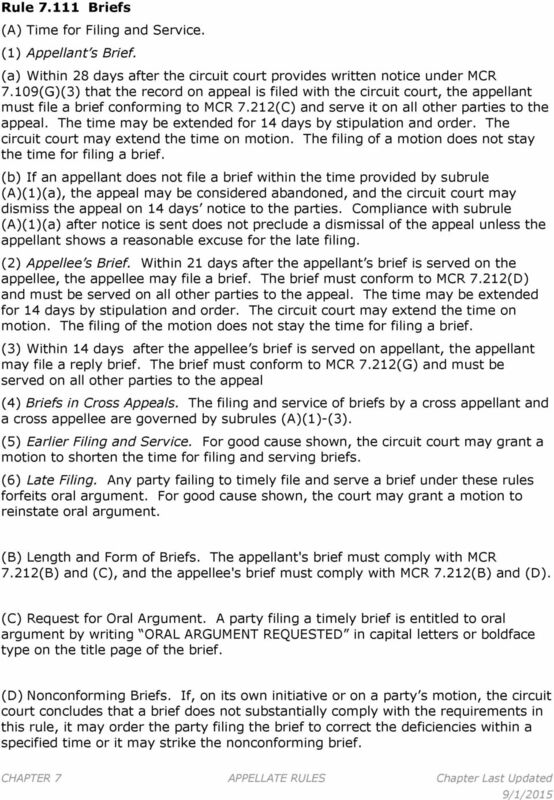 Briefs must comply with MCR 7.111, except: (a) the appellant s brief is due 28 days after the record is served on the parties, and (b) the appellee s brief, if filed, is due 21 days after the appellant s brief is served on the appellee. (3) Burden of Proof. 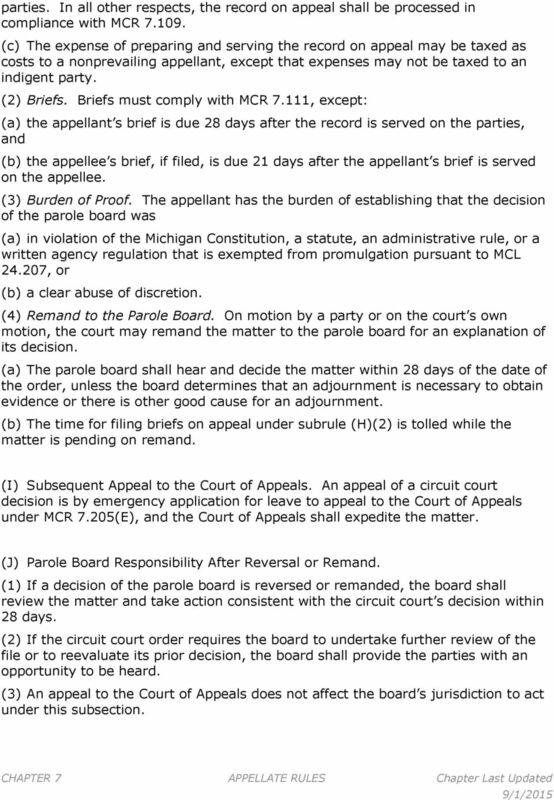 The appellant has the burden of establishing that the decision of the parole board was (a) in violation of the Michigan Constitution, a statute, an administrative rule, or a written agency regulation that is exempted from promulgation pursuant to MCL , or (b) a clear abuse of discretion. (4) Remand to the Parole Board. On motion by a party or on the court s own motion, the court may remand the matter to the parole board for an explanation of its decision. (a) The parole board shall hear and decide the matter within 28 days of the date of the order, unless the board determines that an adjournment is necessary to obtain evidence or there is other good cause for an adjournment. (b) The time for filing briefs on appeal under subrule (H)(2) is tolled while the matter is pending on remand. (I) Subsequent Appeal to the Court of Appeals. An appeal of a circuit court decision is by emergency application for leave to appeal to the Court of Appeals under MCR 7.205(E), and the Court of Appeals shall expedite the matter. 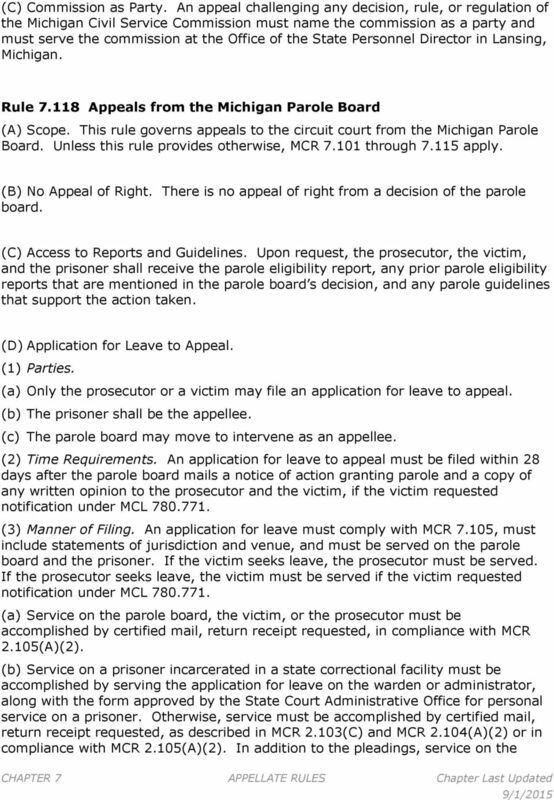 (J) Parole Board Responsibility After Reversal or Remand. (1) If a decision of the parole board is reversed or remanded, the board shall review the matter and take action consistent with the circuit court s decision within 28 days. (2) If the circuit court order requires the board to undertake further review of the file or to reevaluate its prior decision, the board shall provide the parties with an opportunity to be heard. (3) An appeal to the Court of Appeals does not affect the board s jurisdiction to act under this subsection. 21 Rule Appeals from Agencies Governed by the Administrative Procedures Act (A) Scope. This rule governs an appeal to the circuit court from an agency decision where MCL et seq. applies. Unless this rule provides otherwise, MCR through MCR apply. (B) Appeal of Right. (1) Time Requirements. Judicial review of a final decision or order shall be by filing a claim of appeal in the circuit court within 60 days after the date of mailing of the notice of the agency s final decision or order. If a rehearing before the agency is timely requested, then the claim of appeal must be filed within 60 days after delivery or mailing of the notice of the agency s decision or order on rehearing, as provided in the statute or constitutional provision authorizing appellate review. (2) Manner of Filing. (a) Claim of Appeal - Form. The claim of appeal shall conform with the requirements of MCR 7.104(C)(1), except that: (i) the party aggrieved by the agency decision is the appellant and is listed first in the caption; and (ii) the party seeking to sustain the agency s decision is the appellee; or (iii) if there is no appellee, then the caption may read In re [name of appellant or other identification of the subject of the appeal], followed by the designation of the appellant. Except where otherwise provided by law, the agency or another party to the case may become an appellee by filing an appearance within 21 days after service of the claim of appeal. (b) Claim of Appeal Content. The claim of appeal must: (i) state [Name of appellant] claims an appeal from the decision entered on [date] by [name of the agency], and (ii) include concise statements of the following: [A] the statute, rule, or other authority enabling the agency to conduct the proceedings; [B] the statute or constitutional provision authorizing appellate review of the agency s decision or order in the circuit court; and [C] the facts on which venue is based under MCL (1). (c) Signature. The claim of appeal must be signed as stated in MCR 7.104(C)(3). (d) Other Documents. In addition to the claim of appeal, the appellant shall also comply with MCR 7.104(D). (e) Filing Requirements in the Agency. The appellant must comply with MCR 7.104(E). 22 (f) Service. In addition to the service requirements found in MCR 7.104(D)(9), the appellant must also serve the Attorney General. (3) Appearance. The appellee shall file an appearance that complies with MCR 7.104(F) within 14 days after service of the claim of appeal. (C) Application for Interlocutory Appeal. A preliminary procedural or intermediate agency action or ruling is not immediately reviewable, except that a court may grant interlocutory appeal of a preliminary, procedural, or intermediate decision by an agency only on a showing that review of the final decision would not be an adequate remedy. (1) Time Requirements. An application for interlocutory appeal must be filed with the court within 14 days of the decision. (2) Manner of Filing. 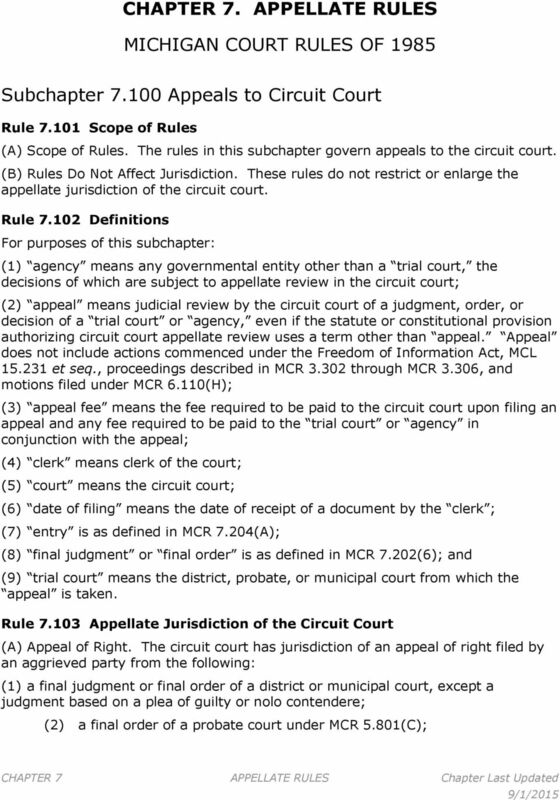 In addition to the requirements of MCR 7.105(B), the application must: (a) include a jurisdictional statement citing: (i) the statute, rule, or other authority enabling the agency to conduct proceedings, and (ii) the statute or constitutional provision authorizing appellate review of the agency s decision or order in the circuit court; (b) include a statement of venue with supporting facts; (c) set forth why review of the agency s final decision will not be an adequate remedy; and (d) state the relief sought. (3) Answer. 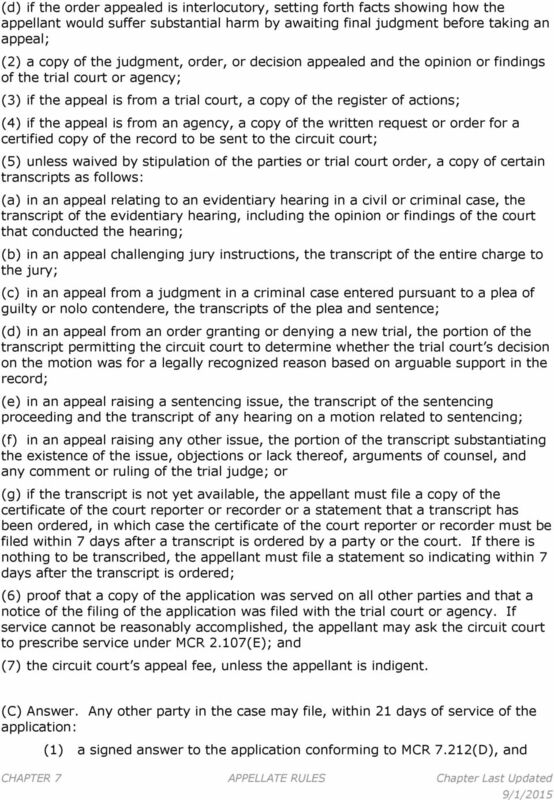 An appellee may file an answer to an application for interlocutory appeal under MCR 7.105(C). The circuit court may require the filing of an answer. (4) If Application is Granted. If the application is granted, the appeal proceeds in the same manner as an appeal of right. (D) Late Appeal. The appellant may file an application for late appeal if permitted by statute. (1) Time Requirements. Unless inconsistent with the statute authorizing the appeal, the application must be filed within six months after entry of the agency decision or order. (2) Manner of Filing. In addition to the requirements of MCR 7.105(B), the application must include: (a) a statement citing the statute authorizing a late appeal; (b) a statement of facts explaining the delay; and (c) statements of jurisdiction and venue complying with subrules (C)(2)(a) and (b). 23 (3) Answer. 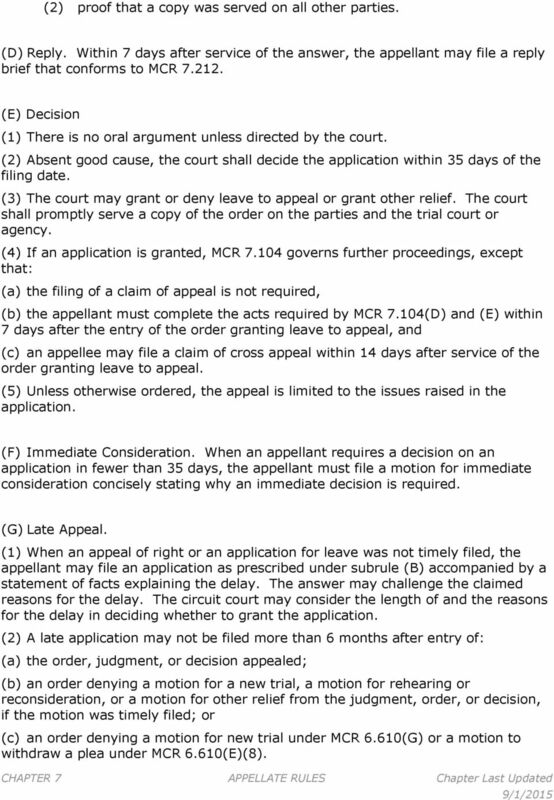 An appellee may file an answer to the application for late appeal under MCR 7.105(C). The circuit court may require the filing of an answer. (4) If Application is Granted. If the application is granted, the appeal proceeds in the same manner as an appeal of right. (E) Stay of Enforcement. The filing of an appeal does not stay enforcement of the agency s decision or order. (1) A party may file a motion seeking a stay in the circuit court. (2) For purposes of this subrule, the agency is entitled to notice even if it has not filed an appearance in the appeal. (3) The court may order a stay on appropriate terms and conditions if it finds that: (a) the moving party will suffer irreparable injury if a stay is not granted; (b) the moving party made a strong showing that it is likely to prevail on the merits; (c) the public interest will not be harmed if a stay is granted; and (d) the harm to the moving party in the absence of a stay outweighs the harm to the other parties to the proceedings if a stay is granted. 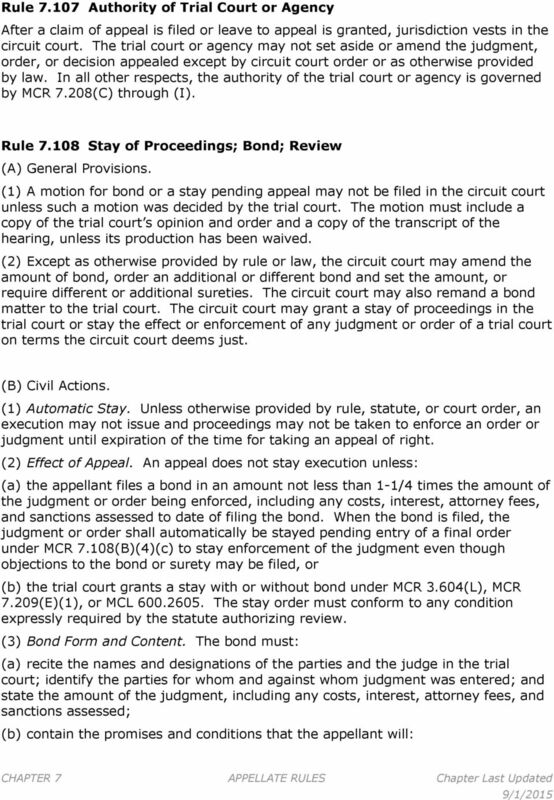 (4) If the motion for stay is granted, the circuit court may set appropriate terms and conditions for the posting of a bond (a) in the amount required by any applicable statute authorizing the appeal, or (b) in an amount and with sureties that the circuit court deems adequate to protect the public and the parties when there are no statutory instructions. (5) Temporary Stay. (a) The circuit court may grant a temporary stay of enforcement without written notice only if (i) it clearly appears from facts alleged in the motion that immediate and irreparable injury will result if a stay is not entered before a hearing, and (ii) the moving party certifies to the court in writing that it made reasonable efforts to contact the other parties and agency, but was unsuccessful. (b) A temporary stay may be granted by the court until a hearing can be held. A hearing on a motion to dissolve a temporary stay will be heard on 24 hours notice, or less on order of the court for good cause shown, and takes precedence over all matters except previously filed matters of the same character. (F) Stipulations. The parties may stipulate regarding any issue on appeal or any part of the record on appeal if the stipulation is embodied in an order entered by the court. Page 1 Massachusetts General Laws Annotated Currentness Part IV. Crimes, Punishments and Proceedings in Criminal Cases (Ch. 263-280) Title II. Proceedings in Criminal Cases (Ch. 275-280) Chapter 278A. Delaware UCCJEA 13 Del. Code 1901 et seq. Delaware UCCJEA 13 Del. Code 1901 et seq. 1901. Short title This chapter may be cited as the Uniform Child Custody Jurisdiction and Enforcement Act. 1902. Definitions As used in this chapter: (1) "Abandoned"
CHAPTER 42A HEARINGS AND APPEALS. Act shall mean the Casino Control Act, N.J.S.A. 5:12-1 et seq. 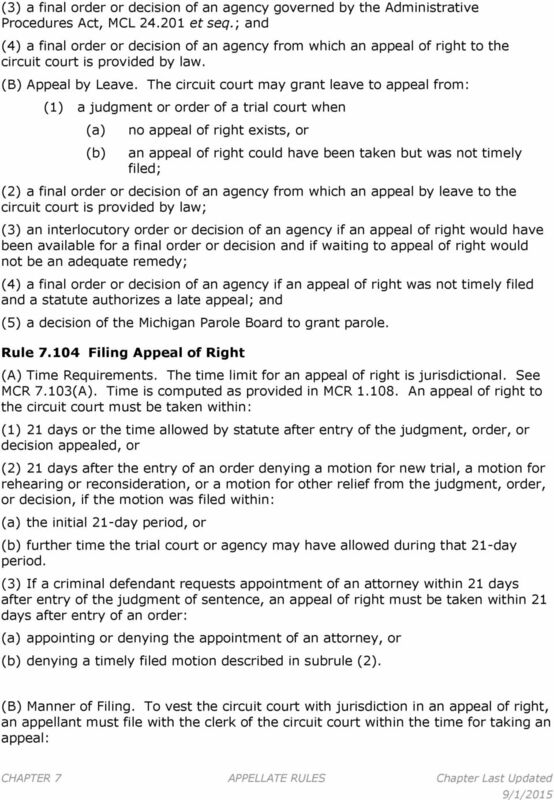 STATE OF MICHIGAN COURT OF APPEALS SENIOR SMITH, Plaintiff-Appellee, UNPUBLISHED November 15, 2012 v No. 304144 Wayne Circuit Court STATE FARM MUTUAL AUTOMOBILE LC No. 11-002535-AV INSURANCE COMPANY, Defendant-Appellant. Last amended by Order dated March 1, 2011; effective May 2, 2011. Last amended by Order dated March 1, 2011; effective May 2, 2011. RULES OF SUPREME COURT OF VIRGINIA PART FOUR PRETRIAL PROCEDURES, DEPOSITIONS AND PRODUCTION AT TRIAL Rule 4:5. Depositions Upon Oral Examination.